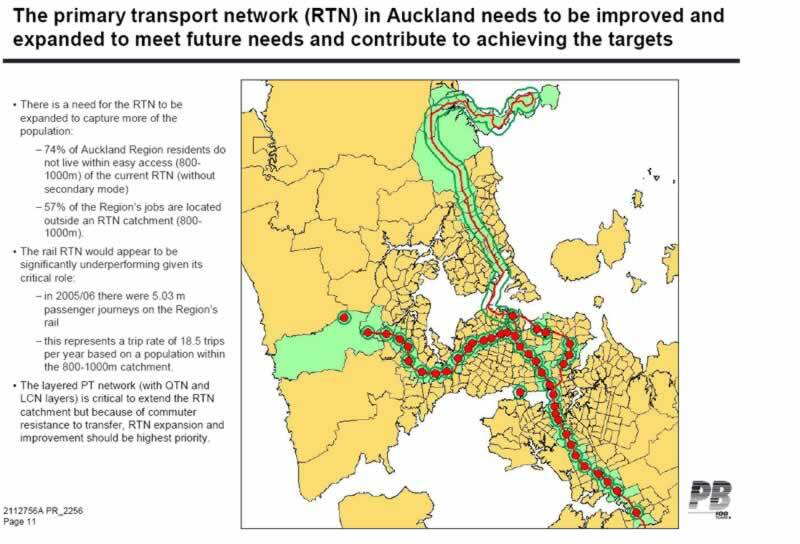 As part of the formulation of the Regional Land Transport Strategy, which is now open for submissions until December 18th, the Auckland Regional Council looked at a range of options to set the ‘strategic direction’ behind the RLTS that they have eventually come up with. 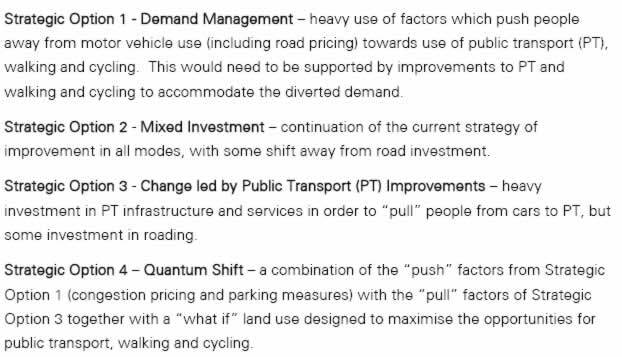 These options are briefly outlined below: The option they have ended up choosing seems to be a bit of a hybrid of all of the above – a bit of demand management (but not road pricing for now) a bit of continued road investment, a bit of public transport led change, and something of a quantum leap. I guess overall it seems like the ARC has gone with a watered down (or realistic, depending on your viewpoint) version of Strategic Option 3. 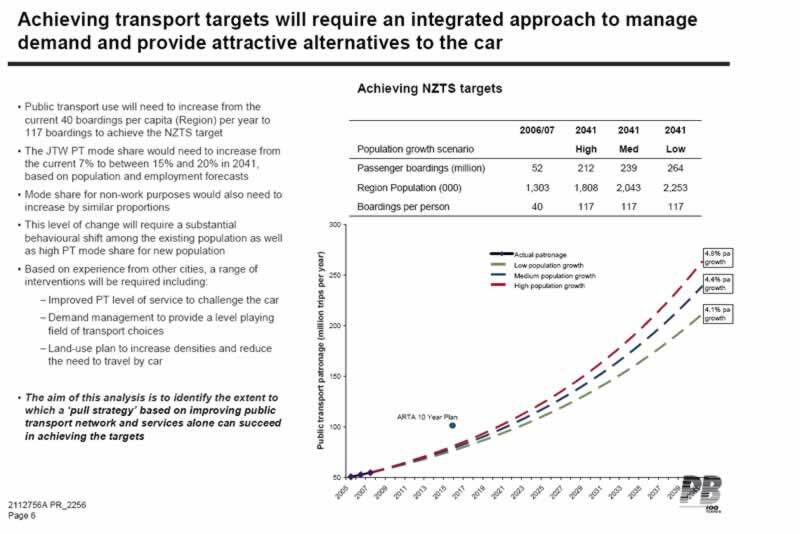 By law, the RLTS is required to give effect to the New Zealand Transport Strategy 2008 (yes I know, there are an enormous number of transport plans and statements and strategies out there). One of the targets set by the NZTS that the RLTS should give effect to is a rise in annual public transport boardings per capita from 40 to 117 boardings. In the end, the preferred option is considered unlikely to meet this target (although you never know! ), but a bit of analysis went into looking at what might be necessary to achieve such a goal. The results of that study, conducted by international transport consultancy Parsons Brinkerhoff, are actually quite interesting. 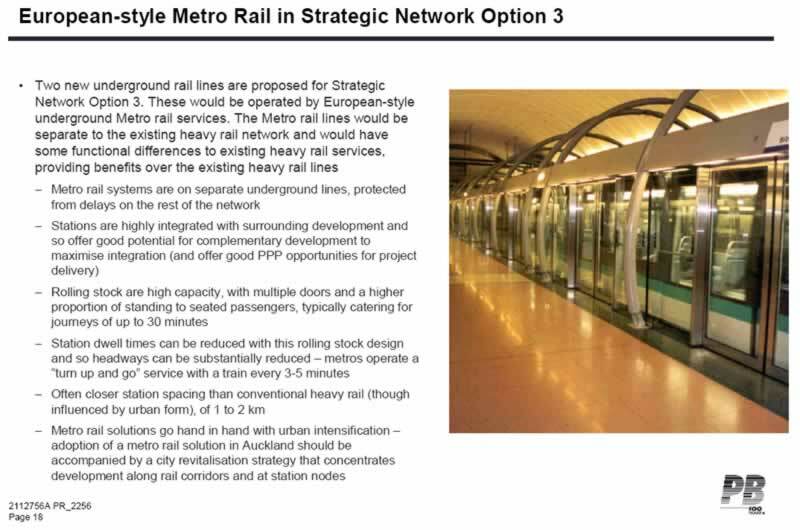 This is the same study I referred to (but never had a full copy of until recently) quite a number of months ago when I learned of discussions about a possible “Auckland Metro System“. I think it was a good idea bringing in an international firm to take a look at this issue – as one gets the feeling that often we can lose sight of the forest for the trees when it comes to transport matters in Auckland, as the famous saying goes. Parsons Brinkerhoff took the opportunity for a ‘clean slate’ look at what would be needed to reach the optimistic target for public transport use set in the New Zealand Transport Strategy: I think they made a bit of a typo mixing up low and high population growth, but despite that it’s pretty daunting to realise that the NZTS goal would involve at least a four-fold increase in the number of public transport users throughout this 30 year period. So what kind of system would be good enough to attract this many users? I think we’re starting to make improvements in this respect – with a separation of Rapid Transit Networks (RTNs), Quality Transit Networks (QTNs) and Local Connector Networks. However, there are barely any services in Auckland at the moment (aside from peak hour Northern Express and Dominion Road buses) that operate at the kind of frequencies that I think are needed for such a network to actually work. Hopefully that will improve over time though. The next major issue outlined by the Parsons Brinkerhoff Study is that very little of Auckland is actually within close proximity to the current Rapid Transit Network. 74% of people live outside easy walking distance of a railway of busway station, while 57% of jobs are located beyond easy walking distance of a railway or busway station. 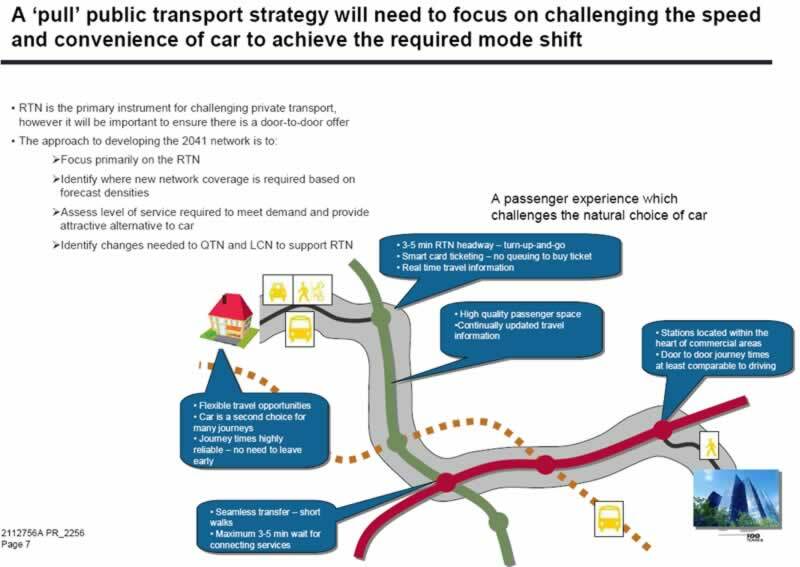 Given that the RTN routes are generally the only (with a few exceptions) routes along which public transport is likely to be faster than someone driving (and therefore significantly increase the likeliness that they will choose public transport) Parsons Brinkerhoff make the point that a lot more people and jobs need to be brought within easy access of the networks. 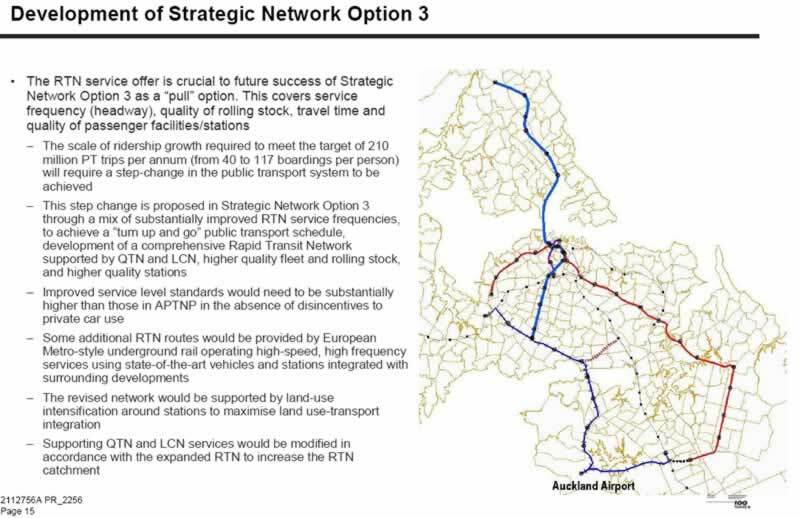 Obviously intensification forms a part of this, but so does extension of the RTN. In developing their final plan for improvements to Auckland’s rapid transit system, Parsons Brinkerhoff focused on population and employment changes between now and 2050 – in particular on the Regional Growth Strategy, which is Auckland’s primary guiding document in terms of where additional people in Auckland will live and work between now and 2050. This makes a lot of sense, focusing on the future and finally doing what I really think needs to be hammered home as many times as possible: integrating land-use planning and transportation planning. Some important points have been picked up here: notably the need to ensure the growing Flat Bush/Dannemora/Botany Downs area has good public transport linkages, that Albany (which is to become the “CBD of the north”) also needs excellent linkages, and also that specific “corridors of development” such as along Dominion Road and Remuera Road, could also be a significant focus for intensification – so therefore warrant consideration for the location of a Rapid Transit Network. 1) The existing RTN rail network is enhanced by construction of the CBD Rail Loop, allowing much higher frequency services on the Western and Southern Lines (3 minute headways during peaks). 2) The Eastern Line would terminate at Britomart and its frequency would be increased to 12 trains per hour at peak times. That is a pretty “wow” network I must say. Obviously it would cost an enormous amount to construct, and perhaps isn’t feasible for a good while yet, but it still makes for interesting reading as to what might be necessary in the future. In the end, the Regional Transport Committee decided to not really take much notice of this report when outlining the “big ticket items” that have been included in the RLTS. The Manukau-Flat Bush-Panmure corridor is proposed to be served by a bus-based QTN in the short-term, with the possibility of upgrading to light-rail in the future; there are no real plans for Dominion Road to ever be anything more than a very well-served bus corridor, and there certainly are no plans for railway line underneath Remuera Road. With regards to my opinion of what Parsons Brinkerhoff have done here, I think that it’s actually a very interesting insight into the issues faced by Auckland, but analysed from an outside perspective. I had never thought of connecting a railway line underneath Dominion Road with a railway line to the North Shore before I read this. I had never thought of extending a railway line from the east to Unitec, to serve the large number of students there either. While not all the ideas were practical (I think the plan was discarded as the number of passengers it would attract probably wasn’t worth the massive price tag it would inevitably have), I think that there is a lot that can be learned from this study. The Manukau-Flat Bush-Panmure RTN really should be rail, we shouldn’t discount turning the Northern Busway into a railway line in the future, and we really really should run our future railway lines from one side of the city, into the CBD and then out the other side. Maybe this might form the basis of the next RLTS. When petrol’s $4 a litre and there’s no pressure to spend any money on new motorways. In the meanwhile, at least I can dream. A very interesting study by Parsons Brinkerhoff. The benefits that they list for the metro lines are very compelling, the only thing stopping them from being constructed is the cost. Another benefit I see to the metro lines is that they would link residential areas, employment and all the tertiary education providers together. Hopefully one day the metro lines come to fruition. 1) Line under Dominion Road. The Dominion Road corridor is a corridor of development rather than a series of nodes. Therefore I think that light-rail with frequent stops would be the best way to provide high quality public transport for that route. A metro would probably only have stops at Valley Road, Balmoral & Mt Roskill – which would miss opportunities for intensification in areas between those nodes. 2) Line under Remuera Road. There is already the Eastern Line and Southern Line in relatively close proximity to this area. Does it really make sense to have three railway lines through this part of the city, when other areas have such little heavy rail? I think not. Apart from those two issues, I think the rest of the system is great. They have put a lot of thought into integrating land-use and transportation, which I think is excellent. I think it depends on what is meant by “Metro”. I think for Auckland it would probably involve running the same EMUs that operate on the rest of the system – and only vary through its extensive underground running. There are advantages to running all your lines as separate entities though – in that problems on one line don’t affect the other lines. Also, it enables really really high frequencies with minimal numbers of tracks. How do you think the RER A line in Paris shifts 1 million people per day on only two tracks? Admittedly it does have a lot of branches – still mighty impressive though. That’s around 5 times as many people as the busiest section of state highway 1 – so imagine a motorway around 25 lanes in each direction and that’s the number of people shifted by that line, which is only two tracks in the central section (which every train passes through).